Ashtons Legal is delighted to announce the sponsorship of Norfolk Knights WRC. 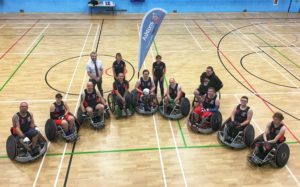 The firm have recently become their kit sponsor with Dave Richardson, Client Relationship Manager at Ashtons Legal attended the unveiling of the new kit at the club’s friendly match against Woodbridge Wheeled Warriors on Saturday. The event took place in Wymondham leisure centre where the Knights won 40-33. The club have been building a social team for both male and female disabled participants. They are open to anyone from the age of 18 interested in learning more about the game and encourage able-bodied volunteers to join to train, become assistants, chair mechanics, coaches and referees.